My study in acupuncture began in 1997, almost the same time as I began to studying homeopathy. Both systems imply the existence of life-force. Acupuncture knows 12 major paths, the so called meridians, through which the life-force flows throughout the day and helps to synchronize the harmonic functioning of all organs, glands and tissues. 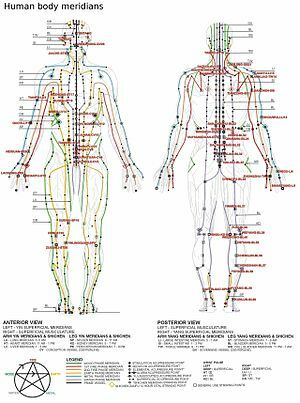 On this meridians exist approximately 360 acupuncture points (plus some extra points), which can be stimulated in acupuncture in order to rebalance the flow of the life-force. I’ve always wondered how it was possible to the ancient Chinese to explore this points and recognize their healing qualities. In homeopathy one performs a self-proving of a remedy and then symptoms appears which can be protocoled and archived in a database. But how was this done in acupuncture??? I actively searched for this “secret” and I found it in Damien Mitchell’s book “Heavenly Streams“. He describes a rather simple technique for activating the energy inside a meridian and then one becomes aware of it’s path and all it’s points. After I learned this technique … I need just a few minutes … the whole path of my lung meridian was energized and I could feel all the points. Strange thing, also my other meridians got energized despite that I only focused exclusively on the lung meridian. 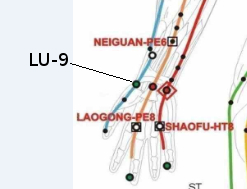 The best way to sync your brain with the unique frequency of a specific meridian is to focus gently (and I repeat here again this very important word … “GENTLY”) on the “point of origin” or source point (yuan), which for the lung meridian is LU-9. With the gentle focus on this point let your awareness sink into the point when you breath in and let your awareness go back on the surface when you breath out. That’s it. This is the entire secret. After some time (it depends on the experience and personality of the person) your awareness expands automatically through the entire meridian and you will be able to explore the quality of each meridian. Mitchell explains that each meridian has it’s own unique quality that can be felt. Well, I admit that they really have a extraordinary different types of qualities which can be felt easily. For example the lung meridian feels like cool electricity and the heart meridian is a expanding fire. Now I’m able to feel almost all my acupuncture points when I focus on them. When I get a cold I can feel how the energy gets stuck in specific acupuncture points and this may be how the ancient Chinese was able to attribute to them the healing properties. They was good observers! The exercise should not exceed 5 minutes in the beginning, else one could tend to force the awareness and this could cause blockages. How does it feel to become healthy again? How to measure Life Force?